I created this piece while a missionary with LAMP Catholic Ministries in the Bronx. 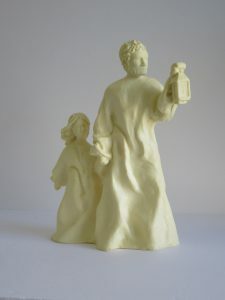 It depicts St. Joseph leading a child into the dark city. A LAMP missionary seeks to share the love of Jesus with the urban poor who often experience a lack of spiritual attention. Central to this task is, in reality, seeing the goodness and beauty of Jesus in the people we serve. I thought this was a good introduction to my Growing Home exhibition because, interiorly, the search for the face of Christ in another human being is, in many ways, like the search for Beauty in the chaos of the city.